TriALco can produce virtually every alloy published by the Aluminum Association, along with any “custom” alloy specifications you may want. Also, we can produce most alloy designations from all over the world – just give us a copy of the specification. Our plant location on the south side of Chicago provides us cost effective means to deliver our alloys, either by truck or rail. We can ship via cargo ship if necessary. Our ability to produce a clean, chemically correct alloy is due to the freedom afforded each department and all personnel. Whether it is regarding new customers and their requirements, personnel safety, employee training or our current production needs. Our people communicate those needs to each other to insure we are all working together to reach a common goal – clean, high-quality aluminum alloys delivered on time, in specification to our customers. Management and production staff regularly discuss preventative safety measures to stay ahead of any potential problems that may confront workers and their safety. Upon arrival, every truck is weighed for accuracy. Raw materials are then unloaded, weights verified and then we test the scrap to confirm its chemical composition. These procedural steps insure our raw materials are ready for melting. We carefully segregate our raw materials for later use. 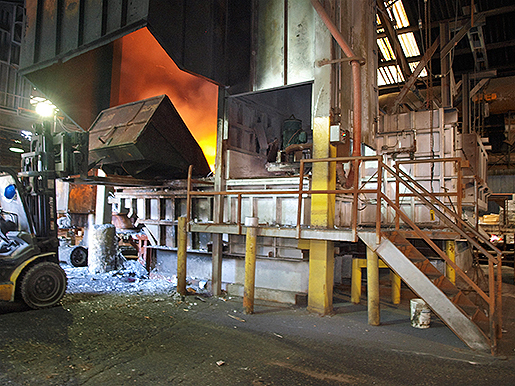 Our relatively smaller furnaces allow us to produce alloys with extremely narrow specification ranges. Forty plus years of experience have taught us that heavy sludge elements bond to refractory where it can bleed back into successive alloys. This and other contributing factors have caused us to use smaller, more efficient furnaces. We can produce our customer’s alloys with extra precision and care. The furnaces are also designed to drain above the bottom 10% of the furnace to prevent heavy elements from being drained into the finished goods and will further enhance cleanliness.